The “Boys of Summer” took the field Sunday in Michigan Community College Athletic Association action, and it felt more like winter. The Grand Rapids Community College Baseball team opened their home season with a doubleheader split against the Kalamazoo Valley Community College Cougars at Belknap Park in Grand Rapids. Sunday’s doubleheader was originally scheduled for Saturday, but was postponed due to cold weather according to the GRCC Athletics Twitter feed. The split puts the Raiders to a 4-15 record on the campaign. The Raiders won Sunday’s first game, 10-1 in seven innings, and the Cougars returned the favor with a 9-1 victory in the second game again in seven innings. When the first pitch of the first game was thrown at 2:05 p.m., the Cougars started out hot with a double from sophomore outfielder Kawambee Moss. He was later caught stealing third base by Raiders freshman pitcher Jacob Wosinski. The Raiders picked up their first run in the first from sophomore center fielder Dylan Limbacher on an error from the Cougars defense. Walks, both on balls and hit batsmen, were the story of both games as the Cougars had 11 free passes in the first game. The volume in which the free passes came gave the Raiders opportunities by putting runners in scoring position. The Raiders broke the game open in the sixth inning when they scored the majority of their runs in the sixth inning when the Cougars pitching staff hit sophomore catcher Cam Brayman, then walked the next two batters. Sophomore second baseman Austin Anderson scored all three runners with a double to deep right field. Anderson later scored on a sacrifice fly from freshman third baseman Brady Paganelli. Limbacher was hit by a pitch then stole his 14th and 15th bases of the year before finally scoring on a single from freshman shortstop Isaac Raab to complete a five-run inning and eventually ending the game in the top of the seventh inning. Wosinski was given the victory in the first game. He had 2 strikeouts, gave up 1 earned run on 5 hits, 4 base on balls and 1 hit batter in 6 innings of work. Cougar freshman right-handed pitcher Nathan Wargolet was charged with the loss and he gave up 3 runs (all unearned) on 7 hits, allowed 3 batters on base on balls and hit 3 batsmen in 4 innings pitched. Sunday’s second game was underway at 4:50 p.m. under sunny and windy conditions at around 26 degrees for the wind chill. 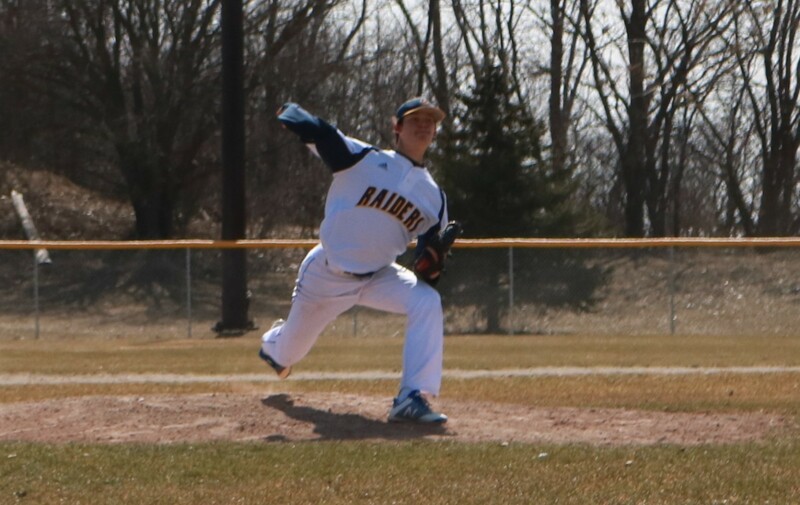 The cold temperatures did not cool off the pitchers as Raiders freshman right-hander Logan Fleming racked up 6 strikeouts in the first three innings, with two in each inning. Cougars sophomore right-handed pitcher Austin Laurencig struck out the first two batters he faced. He also racked up 2 strikeouts in each of the first 3 innings. As the game picked up, so did the winds and the temperatures fell and so did the Raiders. The Raider’s pitching staff allowed a 3-run triple from Moss in the fifth inning. They then had a sequence in the sixth inning where two pitchers faced one batter apiece and allowed four-pitch walks to their lone batter. The sequence came in the middle of a 6-run inning where the Cougars batted around the order. Raiders pitching walked three consecutive batters and gave up 3 hits as well as a 3-run double from sophomore third baseman Colton White. The Raiders went 1-2-3 in the 7th to end the game and lose 9-1. The loss was charged to Fleming despite his 9 strikeouts. Laurencig was credited with the win in the second matchup. The Raiders will head to Calvin College to take on the Knights’ Junior Varsity squad on Tuesday, March 27 with the first pitch scheduled for 3:30 p.m. The Raiders return to Belknap Park on Saturday, March 31 against the Ancilla College Chargers for a MJCAA doubleheader with first pitch tabbed for 1 p.m.